ok so i officially think that hollywood is lazy and arrogant. i mean, it has been coming for the last several years with the proliferation of remakes. basically negating the originals, unless you are one of the few non cinephiles who still enjoys seeing quality film not just the poor recreations, for the last several years. is it just me or does this spell absolute laziness on the part of over paid wall street...oh sorry i mean hollywood producers and executives. there are plenty of "new stories" as in originally created made by unknown writers that could be made into thoughtful and engaging films. yet instead we choose to recreate almost word for word a wonderful british comedy that is less than two years old. 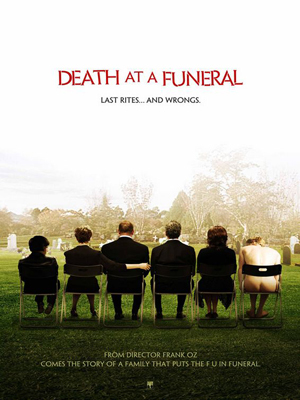 why in the hell are they remaking "death at a funeral"? seriously people was the first one not incredible...or is it that since alan tuydk and peter dinklage (oh who by the way is in the remake playing...oh my the same character) are the only american actors that it isn't good enough for americans...or was it "cheaper" ie you got to take home more money because the script was in hand and there were really no rewrites (given all the scenes that are being previewed are essentially word for word from the original..including delivery). while i don't like the concept i guess part of me could understand why one would choose to rip off...i mean remake a film that was not a english language film (mostly martha, wings of desire) but why, tell me why wouldn't you just encourage people to see the original if it was a well made and funny english language film and then come up with something new to make into a film? i can understand taking something like shakespeare or austin and setting it in the context of the modern or different setting but really people remaking a movie that just came out TWO years ago and did well....how dumb do you think we as you audience are....yes i know really dumb because you don't think most people in america will know that it is a remake of a recent british movie. and this stupidity is why friends, i want to do something to change how we think and engage with film so this doesn't keep happening!! !